Ready for Your Brand’s “One Shining Moment? If you have ever watched CBS’s coverage of the NCAA tournament, you know the theme song for the road to the Championship is “One Shining Moment,” a chance for any of the 64 teams to have that special moment in the spotlight. On Friday, that moment came true not only for the University of Maryland Baltimore County (UMBC), but for its Twitter handle. 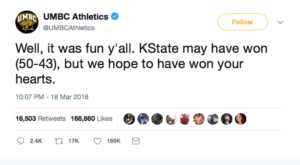 While the school became the first men’s 16 seed to take down a top-rated team, the school’s athletic department Twitter page got its one shining moment. While the school could not have possibly anticipated the upset, it was ready. Just the magic of being at the tournament was enough for the department’s director of media Zach Seidel to ask permission to live tweet the game, “My boss gave me the green light to give the handle a personality, so I did,” he told CNN. What was an account with 5,000 followers had 96,000 by Sunday and no doubt, awareness of the school is higher today outside of Baltimore than it ever was. So how was Seidel successful? Perhaps the biggest asset was history with the brand. He had supported the athletic department starting as intern ten years ago so could think quickly in the moment, knew his story, and was even able to pull up some old negative tweets from opposing schools and ask how the view was from their living rooms. Classically, colleges “dancing” in the NCAA tournament experience a lift in admissions, and UMBC was ready to extend their “real time moment” into powerful earned media in top-tier press. They leveraged the opportunity to not just tell a “cute” Twitter handle story, but also underscore its powerful academic creds in the New York Times, as well. It was a moment to tell their “brand” story and they did so with aplomb. Train and then give permission to dedicated, experienced community managers who can help you navigate in real time. While the Retrievers don’t get to go the Sweet Sixteen, they’ve already won the Twitter war, gained an incredible followership and had some fun along the way. Bill Zucker is a Partner and Managing Director of Ketchum Midwest and Canada, and watching a March Madness without his alma mater (University of Wisconsin-Madison) for the first time in 20 years. Abby Lovett is an SVP in the Midwest Brand Practice. She holds an M.S. in Communication and Management from Northwestern University and a B.A. in writing from DePauw. This post was originally published on Ketchum.